Every Christian wants to be blessed by God, but it seems that so few today want to do what God says to do to experience that blessing. That is, get busy studying Bible Prophecy. Believe it or not, God has actually promised a three-fold blessing for those who would read it, hear it and take it to heart, over and over again, day after day. However, many Christians today not only refuse to study Bible Prophecy, but they even says things like, “Don’t make me read this! Don’t make me hear this week after week! Don’t make me take this to heart! This is freaking me out! Stop!” And they miss out on God’s wonderful blessing. 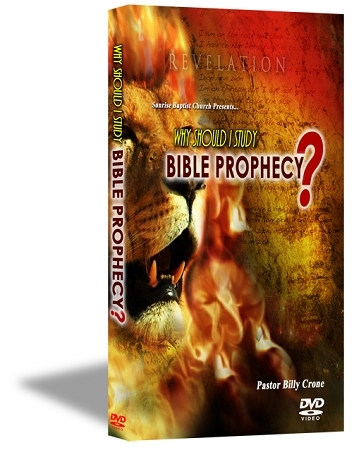 Therefore, this study, Why Should I Study Bible Prophecy, reminds us of three wonderful reasons why studying Bible Prophecy is in fact a blessing to us. It reminds us that we’re going to heaven. It reminds us we’re going to the Millennium and it reminds us that we’re going to see our KING. Are you sick and tired of focusing on nothing but your problems, your pain and this wicked world system? Then get back to studying Bible Prophecy and be blessed beyond measure! That’s why you should study Bible Prophecy!